Atlantis Foundries, a company situated in the industrial suburb of Atlantis, specialises in casting engine blocks for commercial trucks and yellow equipment for export to engine manufacturers in the UK, USA, Brazil and China. Being part of a global supply chain and part of one of the largest foundry networks for engine parts in the world, Atlantis Foundries is equipped with the latest technology, development and expertise to challenge the future. Atlantis Foundries contacted Robotic Innovations regarding a problem that they were experiencing with their existing system, and asked our experts for advice and a solution that could integrate into their current system in order to improve quality, health & safety and efficiency, that was costing them time and money. A manual process comprising of 3 operators with an overhead KBK crane and gripper that needed to be set up before each block was moved, was what was being used. This process involved grabbing the core package weighing 460kg’s, rotating it 90 degrees to remove the last little bit of the sand and debris and then loading the core into the transfer carriage. As you can imagine, this was a very timely and laborious task involved for each block. This task took its toll on the loading operators, often leading to injuries and Atlantis Foundries needed to find a solution to this problem. FANUC Robot M-900iB is the intelligent heavy payload robot with the wrist capacity of 280kg – 700kg. 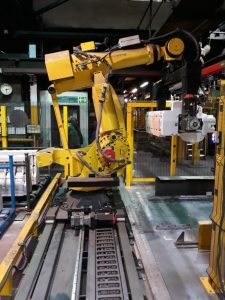 Robotic Innovations supplied a Fanuc M900iB_700kg robot that operates on an 8m linear rail, moving between the two loading stations. The position is dependent on the engine block type and hence these 2 stations were programmed for loading. Each station comprised of 2 pallets loaded with 3 core packages that the robot offloads into the core transfer carriages. The forklifts are able to unload the empty pallets and reload that station with full pallets, whilst the robot is busy offloading the pallet next to it. This ensures the robot is never waiting for a forklift. Even though the blocks are robotically loaded onto the pallets, they are transferred within the plant by forklifts. The core packages tend to move when they are transported on the pallet, and with over 1000 pallets in the system not all the pallets are exactly the same due to wear and tear. Robots will go to the same programmed position to perform tasks every time. This posed a problem. How to pick parts off pallets where neither the parts nor the pallets were always in the same position? The answer was to use the Fanuc fully integrated 3D camera. This camera allows the robot to not only detect part movement in the lateral and bilateral planes, but also detects height variations. This Fanuc 3D camera implementation was the first of its kind to be fully functional within an industrial environment in Africa. Conditions and processes in the work environment have since improved, as operators no longer had such a physical role. The quality of the engine blocks also improved significantly due to better core package placement and damages. The robotic 3D camera system made this project possible, and literally gave the robot system “eyes”.